When I saw in the program that the last song at Trinity UMC’s Christmas choir concert was Mark A. Miller’s “Child of God,” I wasn’t particularly impressed. It’s an okay song, I thought, but not very Christmas-y. I am a child, I am a child of God. 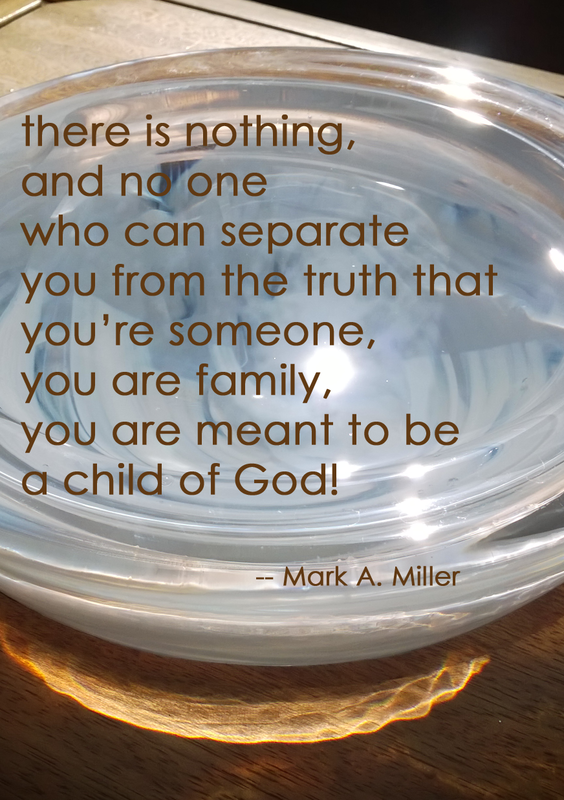 you are a child, you are a child of God. The song is true, it’s deep, it’s Gospel. Still, whenever I’d heard the song before, and when I’d viewed the available videos, I’d found it to be bland, abstract, without a Gospel energy that matched the message. * The setting in which I’d sung it in worship didn’t improve things much — a hotel conference room with lousy acoustics. The song just didn’t “work” for me. So at Trinity’s Christmas Festival of Light, at the close of what I knew would be excellent program of some of the most stirring music of Christmas, I expected that the song would be a letdown, and out of context. We in the audience had been saturated with the music of Christmas for an hour or so, filled with the solemnity of the gospel message in classical and modern forms, with excellence and joy. But now, as a choral benediction, the choir members filed out of the chancel, and filled front and side aisles of the packed church. (Yes, a packed church in secular, hip Seattle – because even if folks aren’t all churchy, it’s coming on toward Christmas, and this is known as a really good program in a really good church.) The singers linked hands – not just “held hands” – they took strong grips on one another, they were a body, as they surrounded us. The piano took up its theme – a stately, strong, confident, Gospel cadence to match the message. And from all sides, the choir faced us, and sang to us, announced to us our place in the family of God, no matter what people say, no matter what anyone says, no matter even what churches may say, and there is nothing, and no one who can separate us from God’s great love. I’m not really writing about the song. I’m writing about communication. Let’s think about why it worked that night. It was partly the quality. Trinity’s choir is excellent, and the evening’s program had been a delight. And “Child of God” was performed with excellence. It was also its place in the program. We were ready. We had been prepared with an hour of the music of Christmas telling the timeless story — also delivered with excellence. And it was the staging. All the other songs of the evening were sung from up front, at some distance, as performers to an audience. For “A Child of God,” the singers surrounded us, enclosed us, made eye contact with us, brought us into one body with them. They were not so much “performing” as delivering good news. Good News. It became our heartbeat. But I have to say, it was also because I had heard it before, several times, when it hadn’t “worked” — and yet, it must have been working on me. The repeated “failed” messages had prepared me to receive it as my own song. Once isn’t enough. When I say something once, I haven’t necessarily communicated it so that it sticks in the mind or heart. When I say it without giving it my best, I’m not communicating that it’s important. When I say it in only one way, I’m not communicating it to people who hear and learn in many ways. The context in which I say it matters: what comes before, what comes after, where we are, what’s going on in the world. My physical presence, body language, eye contact matter. That’s something to remember and repeat, as we begin the new year. * My impression of the original song as subdued, low-energy, is probably related to the fact that it was born of the ongoing grief and pain of our United Methodist Church, which had once again denied someone’s God-breathed vocation to United Methodist ministry because of who they are.